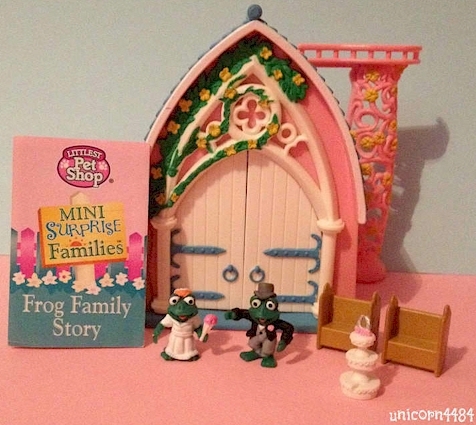 Mini Surprise Families are the newest addition to the Littlest Pet Shop! They've made their happy homes in the most surprising places, giving new life to old teapots, baskets and more. 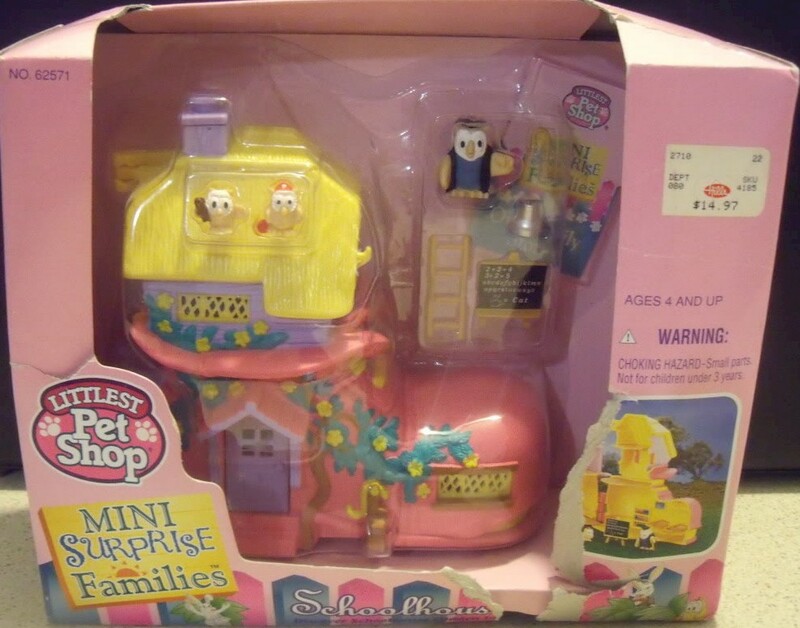 Collect them all and help fill all their tiny homes with the warmth of family love and happiness! 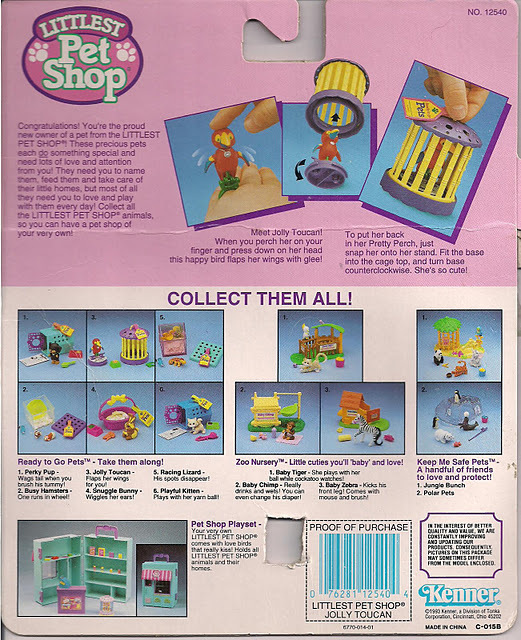 The sets in the Home Sweet Home Assortment were originally released in Vivid Imaginations' Teeny Weeny Families toy line; more specific information is provided with each set's info below. 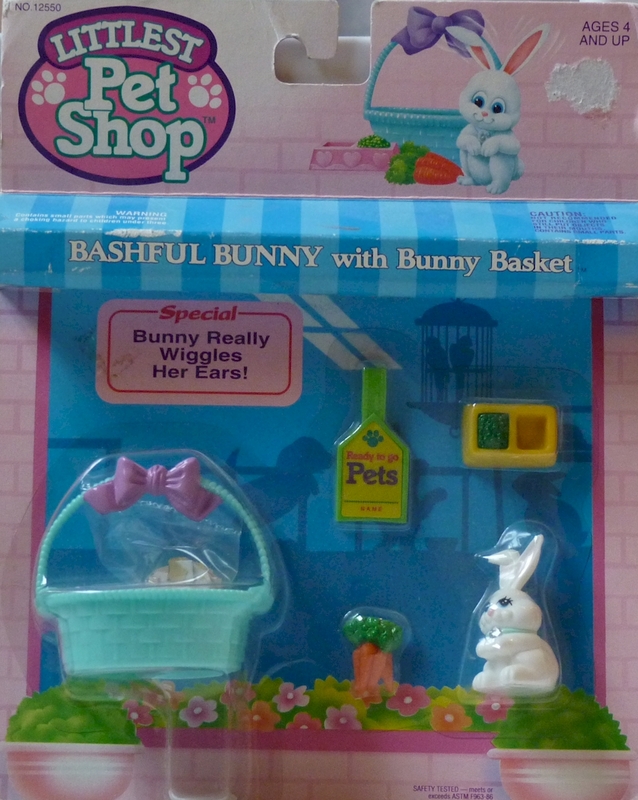 When released by Hasbro's subsidiary Kenner in the Littlest Pet Shop line, these toys were made under license from Dixon-Manning Limited and were copyright Vivid Imaginations Limited. 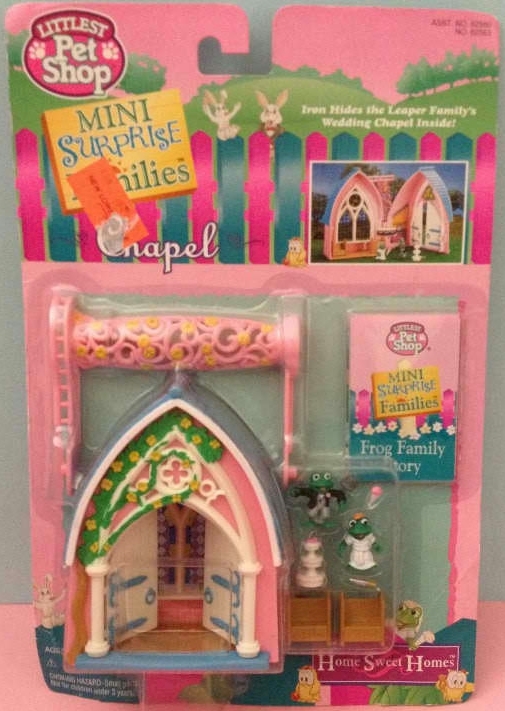 The Chapel was originally released as "Katie's Wedding" in Vivid Imaginations' Teeny Weeny Families toy line. For more photos and information, please visit the Teeny Weeny Families ID Guide. 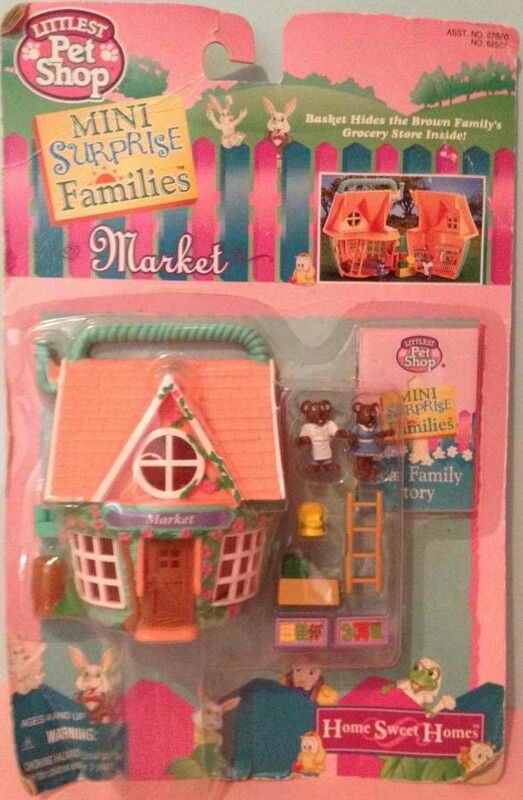 The Market was originally released as "Brown's Mini Market" in Vivid Imaginations' Teeny Weeny Families toy line. For more photos and information, please visit the Teeny Weeny Families ID Guide. 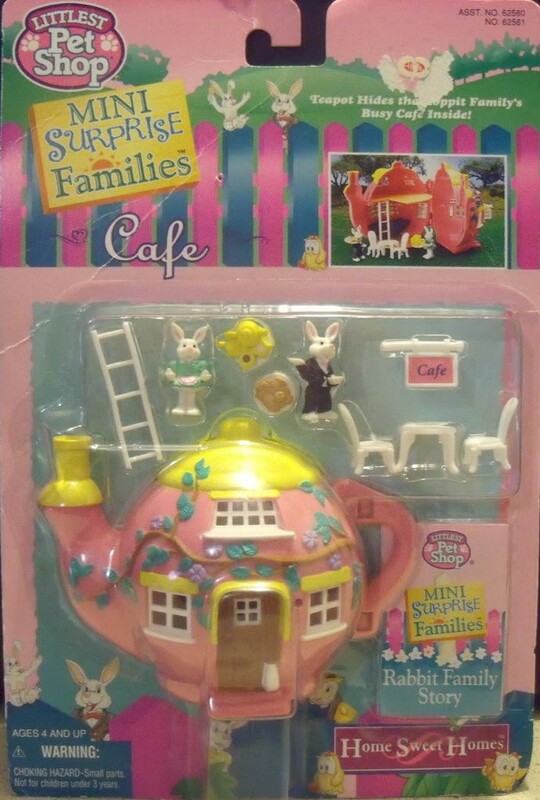 The Cafe was originally released as the "Hippity Hop Cafe" in Vivid Imaginations' Teeny Weeny Families toy line. For more photos and information, please visit the Teeny Weeny Families ID Guide. 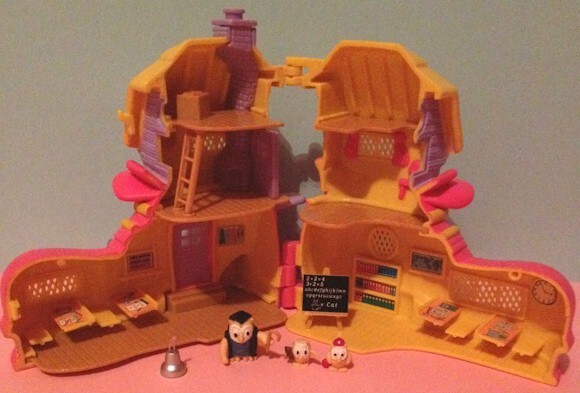 "Mrs. Tooter, the school teacher, flew to Gardenville with her two chicks, Amy Tooter and Ian Tooter, under her wing. 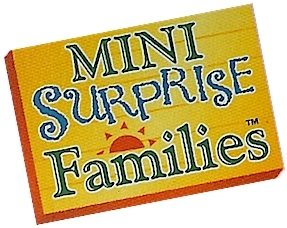 There they met the other Mini Surprise Families, who persuaded Mrs. Tooter to stay and run the school. 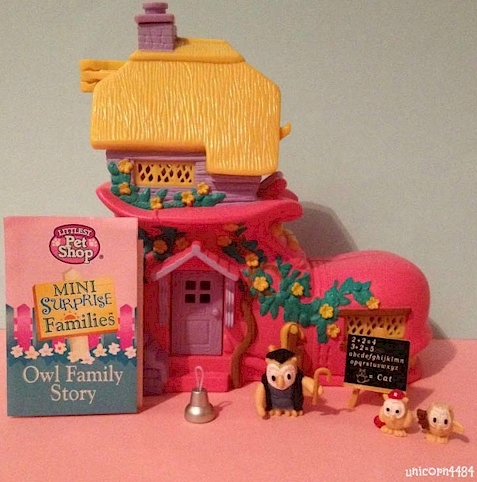 An old boot was dusted off and everyone helped decorate the new schoolhouse, which opened soon afterwards with a full class of Mini Surprise Families children: frogs, rabbits, ducks, bears, and, of course, her very own little owl chicks." 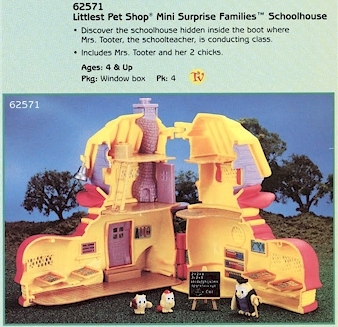 The Schoolhouse was originally released as the "Teeny Weeny High School" in Vivid Imaginations' Teeny Weeny Families toy line. For more photos and information, please visit the Teeny Weeny Families ID Guide. 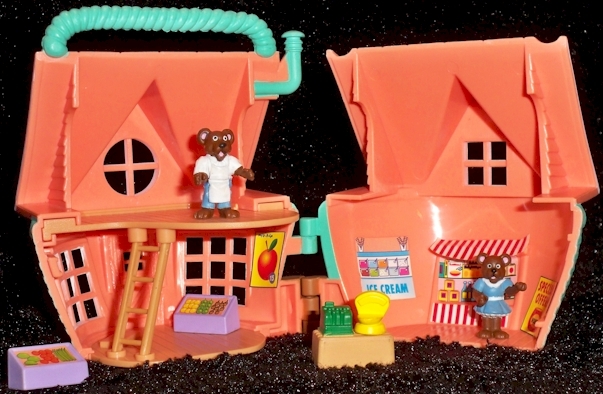 Sets in the Hiding Places Assortment combined figures & accessories from Vivid Imaginations' Teeny Weeny Families toy line with playsets from Kenner's Fairy Winkles toy line; more specific information is provided with each set's info below. 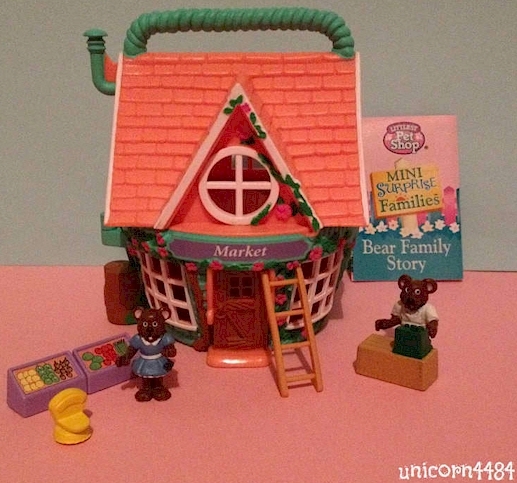 "The Brown kids feel so lucky to be growing up in the beautiful, secret world of Gardenville. 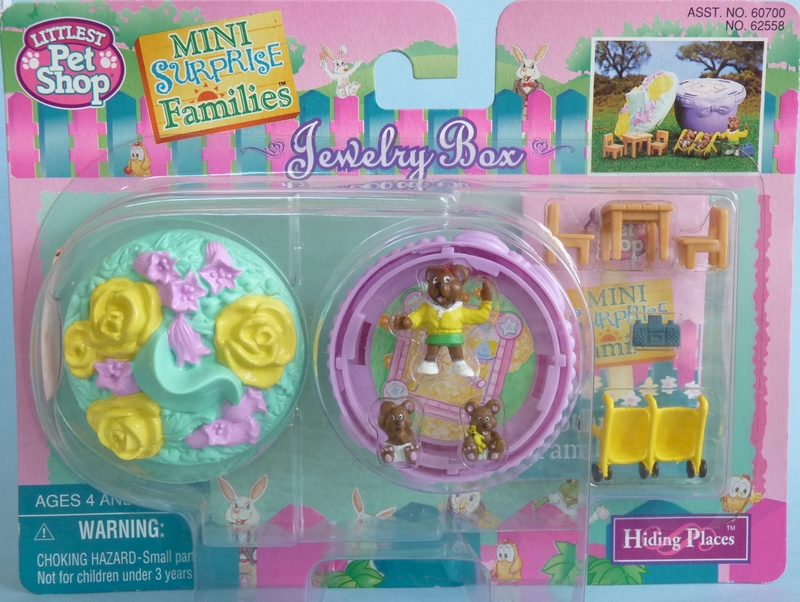 When big sis, Beth Brown, doesn't have plans to meet her friends after school, she loves to play with her new twin brother and sister in the happy playroom Pops Brown made for them out of a tiny, old jewelry box he found hidden away in the shed. Would you like to go for a stroll with them?" 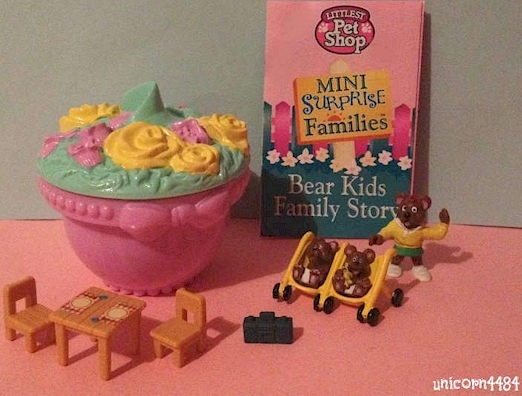 The figures & accessories from the Jewelry Box were originally released in the "Rollin' & Strollin'" set and the "Lunch at Last!" 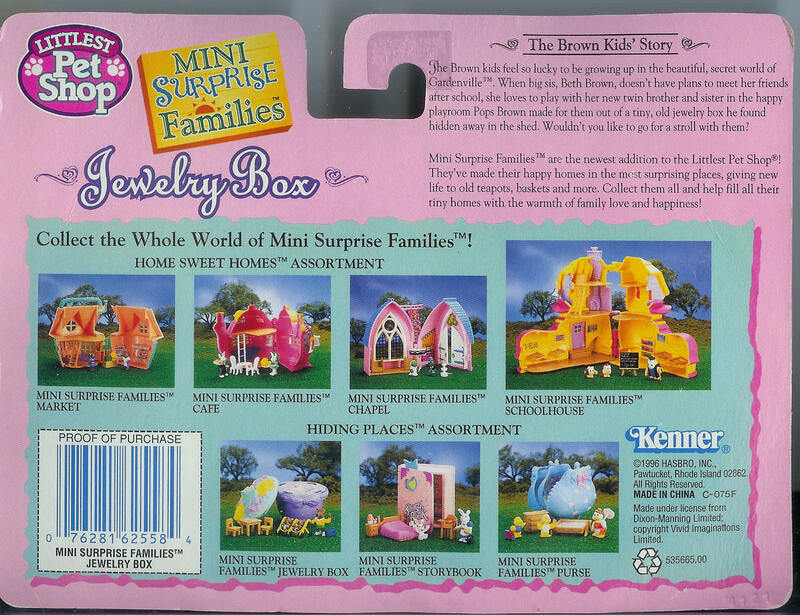 set in Vivid Imaginations' Teeny Weeny Families toy line, while the jewelry box playset was released as the "Hide 'n Play Jewelry Box" in Kenner's Fairy Winkles toy line. For more photos and information, please visit the Teeny Weeny Families ID Guide and Ghost of the Doll's Fairy Winkles Guide. 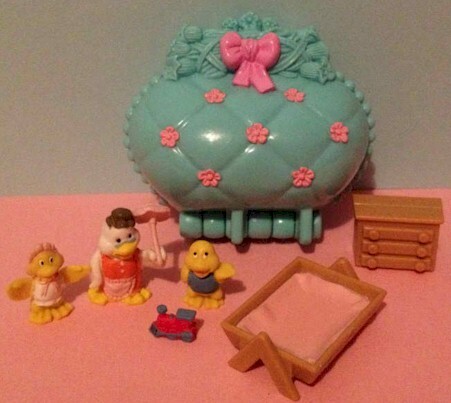 The figures & accessories from the Jewelry Box were originally released in "Baby Sally's Teatime!" set and the "Hotel Helpers!" 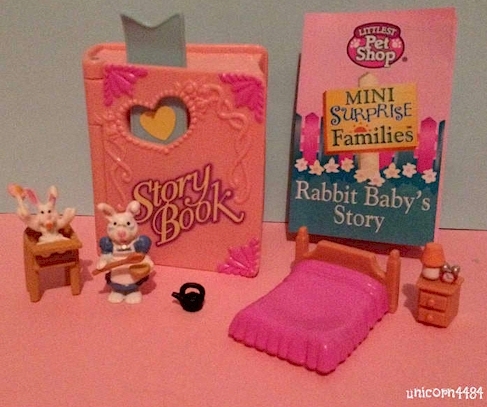 set in Vivid Imaginations' Teeny Weeny Families toy line, while the book playset was released in the "Special Friends Address Book" set in Kenner's Fairy Winkles toy line. For more photos and information, please visit the Teeny Weeny Families ID Guide and Ghost of the Doll's Fairy Winkles Guide. 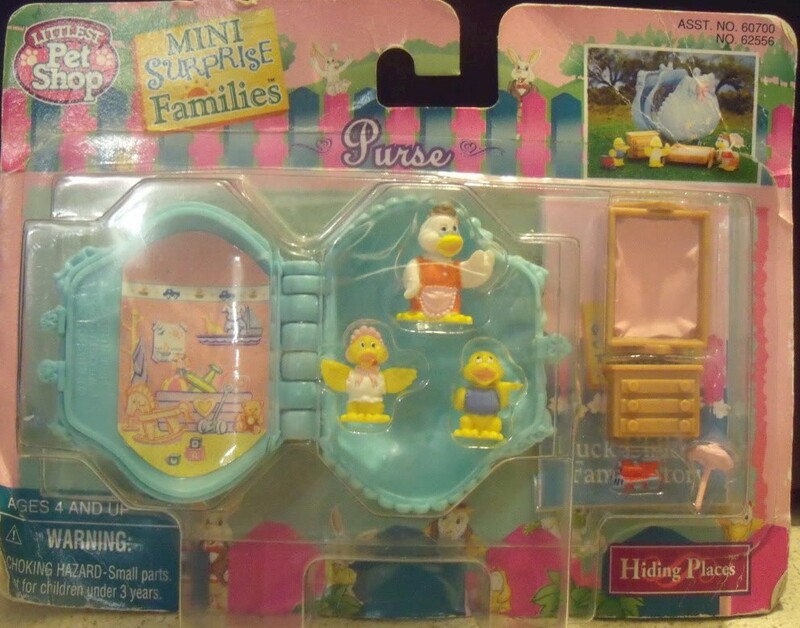 The figures from the Purse were originally released as the "Bedtime Capers!" 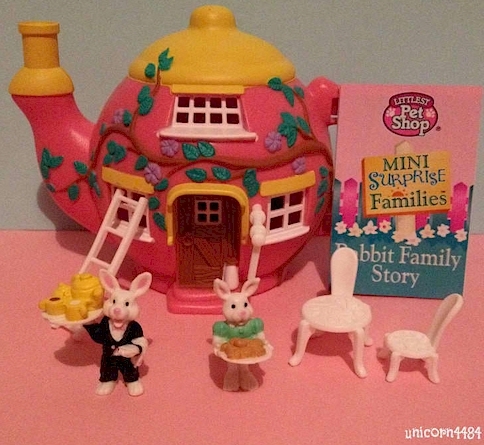 set in Vivid Imaginations' Teeny Weeny Families toy line, while the purse was released as the "Treasure Purse" in Kenner's Fairy Winkles toy line. For more photos and information, please visit the Teeny Weeny Families ID Guide and Ghost of the Doll's Fairy Winkles Guide.